That’s right folks! January means it’s time for the biggest Whole30 of the year! We know you’re eager to learn more. Join us below for our comprehensive list of Whole30 tips to help you thrive and survive your Whole30. From meal prep to cutting junk foods, we’ve got the facts you need to succeed during your January Whole30. The Whole30 Diet is a 30-day restriction of inflammatory food groups like dairy, grains, sugar, and legumes. The idea behind this highly restrictive diet is very similar to the ideas behind other elimination diets. The user cuts out irritants for 30 days before slowly reintroducing them. This will show dieters what foods cause what problems in their own body. At the end, Whole30 participants should experience new tastes and a changed relationship with food. Many, now better informed on their bodies, are able to choose another diet or lifestyle that caters best to their specific eating habits. Whole30’s passionate founder, Melissa Hartwig, conceived the idea with her ex-husband in 2009. While holding a sleeve of Thin Mints, she was challenged to a month of ‘squeaky-clean eating’. This was the beginning of the very first Whole30. By the time she quit her day job in 2010, Hartwig had established a brand with a massive following of believers. Today the brand boasts over half a million followers on Instagram and growing. Her favorite part? Hartwig says it’s being able to run her company in a way that best serves her community. You’re not the only one wondering! The paleo diet and Whole30 diet are definitely matched in terms of effort. Both ideologies focus on eliminating inflammatory foods as well as not counting calories. Additionally, the Paleo and Whole30 diet emphasize the importance of ‘whole foods’. Whole foods or ‘good foods’ are products that have been processed a minimal amount. The list of differences is (unsurprisingly!) longer. First, anyone who has gone paleo will quickly remind you that it isn’t a diet but a lifestyle. Paleo is structured for day to day eating, whereas the Whole30 diet is a reset. Paleo has no foreseeable end, but Whole30 is structured around (duh) 30 days. Additionally, the Whole30 diet has a plan for followers to reintroduce foods, which paleo does not. Another clear divider between these two is their beliefs on treat foods. Paleo has several reinventions of family favorites like pizza, chili, and even ice cream. Melissa Hartwig doesn’t feel the same way. The Whole30 diet is geared towards changing tastes and habits. So even though bananas and eggs are Whole30-compliant, you can’t make those banana pancakes. Finally, some are stricter than others. Paleo has a lot of flexibility for followers. Participants are encouraged to follow guides as closely as possible. Users who don’t feel affected by grains or dairy are allowed to reintroduce them if they wish. The Whole30 diet is not as forgiving. If you fall off, users must restart their 30 days of food restriction. Still unsure if you can follow the tight rules of the Whole30 diet? Start with a Paleo 30 Day Challenge! Paleo’s less-restrictive nature still touts multiple benefits including weight loss. How Can I Make a Whole30 Shopping List? No one enjoys making a shopping list, especially when there are so many restrictions. We get it! However, shopping lists and meal planning are vital for Whole30 clients. Followers that don’t plan food ahead do not often succeed during their Whole30. Make sure to set aside time each week to make up a menu. Need ideas? Scour your favorite brands’ blogs for gems like this easy Whole30 recipe. Once you’ve chosen your recipes, consult our list below to build your own Whole30 shopping list. The biggest idea behind the Whole30 diet is simplicity. The Whole30 follower should be eating a balanced amount of protein, limited amounts of fruit, and lots of healthy fats. Hartwig advises choosing foods with as few pronounceable, ingredients as possible as well. Need more specifics? Read our yes and no lists below. Vegetables: as much as you want! Yes, even potatoes are allowed. Be mindful to balance them with nutrient-dense options like dark leafy greens and cruciferous veggies. Fruits… in moderation. Remember: a big idea of Whole30 is cutting sugar. There can be a lot of sugar in fruit. Make sure those natural sweets aren’t a large percent of your daily intake. Unprocessed meats, seafood, and eggs. You’ll need lots of protein during your Whole30. Make sure to read labels for preservatives and additives in products like sausage. Nuts and seeds. Don’t forget! Peanuts are a legume so they aren’t Whole30 compliant. Coffee and tea. These morning favorites fit right into your Whole30. Just make sure to avoid any sweeteners and reach for a nut milk for your creamer instead. Certain oils. Coconut oil is your new best friend, but olive oil is also compliant. Have you tried ghee (aka clarified butter)? Because the lactose has been evaporated, ghee is also Whole30 approved. Added sugars – real or fake! The only allowed added sweetener on the Whole30 diet is fruit juice, but just barely. The idea is to change your taste to fix your cravings. Don’t skip this rule! Alcohol in any form. Yes, even for cooking. This also excludes vanilla extract. All grains. Grains’ inflammatory nature lends itself to exclusion. Don’t forget to check labels. Many processed and even lightly-processed foods contain forms of grain. Bye bye beans. Similar to Paleo, the Whole30 diet excludes legumes. Like grains, they are not easily processed in the body. The legume grouping also includes peanuts. Sorry friends! Don’t do dairy. Lactose is a carbohydrate found in milk and other dairy products. The issue with lactose is that 75% of the population stop producing the enzyme to digest it after weaning. Simple solution: cut it. Your energy levels won’t immediately increase. Not only this, the first 14 days of the Whole30 Diet aren’t exactly a walk in the park. Most people complain from dull headaches, fatigue, breakouts, bloating, or irregularity. Although unpleasant, these symptoms all are signs of your Whole30 diet working! As an elimination diet, Whole30 is very good at cleaning multiple systems in your body. It’s not fun detoxing all the chemicals found in processed food, but Hartwig promises it’s worth it. 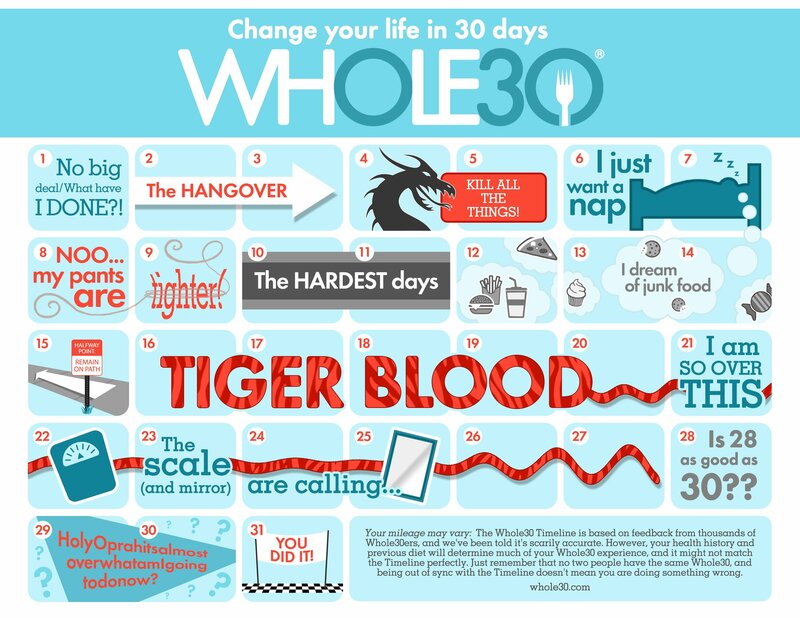 Check out her fun-but-accurate 30-day mood calendar on Whole30 here. Don’t let sneaky condiments ruin your Whole30. Often, one of the scariest parts of the Whole30 diet is axing beloved condiments. Why do you have to? Many popular sauces like ketchup and mayonnaise contain added sugar. Be wary when adding mustard as well. Dijon tends to contain white wine. Hummus? Garbanzo beans, the main ingredient, are a legume and therefore not compliant. If you’re looking for a new sauce to fall in love with try tahini. This sesame-derived sauce makes a great swap, but remember always check labels! Once you cheat your Whole30 is technically over. Real talk: Whole30 constipation. Not the most fun to discuss, blockage on this diet is a real issue. What causes this? Experts say user error. Make sure as you restrict your diet, you still continue to vary it. Refocus on getting a variety of food on your plate. Fruit in excess can cause serious back up in your system. Additionally, try cutting back on nuts. Although some are compliant, they are not all FODMAP friendly which can mean some serious constipation. If constipation persists, up your healthy fats intake and supplement with magnesium tablets. You will survive Whole30 Day 3. Don’t let the infamous Day 3 discourage you. Many newcomers drop out at this point for one big reason: failure to prepare. This can happen several ways. First, actual failure to prepare. Make sure you meal plan, meal prep, and create a Whole30 shopping list every week. This will make social and mental preparation more possible. Prepare socially for all the Whole30 naysayers at the office who will try to peer pressure you into that birthday cake. One after hours drink or even a tiny slice does mean your Whole30 is over! Finally ensure you’re emotionally prepared for this journey. Find support groups to help fortify your resolve and avoid emotional eating. Can I do Whole30 while pregnant? Absolutely! This point is backed by Hartwig’s co-founding of spin-off brand Healthy Mama Happy Baby. Launched in late 2015 with Paleo-superstar Steph Gruenke, the program has garnered a lot of buzz. Hartwig and Gruenke (also a registered dietician) planned every detail to ensure safety and efficacy. The biggest concern for most is weight loss. Both founders ensure this isn’t an issue if Whole30 rules are followed correctly. It’s okay to eat more food and calories as long as the food is nutrient dense and compliant. Food aversion? This can be difficult when you need protein during pregnancy. Gruenke suggests a Whole30 bone broth to sooth your tummy, maintain protein intake, and supplement your collagen and biotin intake. If you are concerned consult your OBGYN before making any major changes to your diet during pregnancy. Could you follow these rules? Ready to step in? Start your Whole30 journey today! For more information about the Whole30 diet visit www.whole30.com for access to all the Whole30 materials available for purchase.